Your local, professional and eco-friendly landscape experts. On time. As Quoted. That’s the ATC Landscape Guarantee. 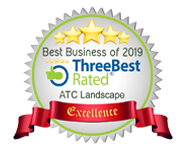 ATC Landscape is Rated as Top 3 in Lawn Care Services! Wondering How the Winter Season Affects Your Lawn? It is my pleasure to provide you with a reference on ATC Contracting & Landscaping Ltd. The company has provided services on four of our commercial properties over the past two years. Steve’s professionalism and integrity have been consistent. He and his team are knowledgeable, dependable and through. Steve’s honesty is a welcome attribute. Overall, I can honestly say that if you do choose to hire ATC on as your landscaper, you will not be disappointed with their services. Hired Steve and his team to do lots of weeding, hedge trimming, maple tree trimming, removal of dead trees, and cleanup. It was awesome to have them show up exactly when they said they would. It is evident that Steve takes his company’s reputation very seriously, and is also very knowledgeable; he made great recommendations based on our requests and followed through on everything. It was amazing to come home to everything cleaned up - even above and beyond what we expected. I would recommend ATC Landscaping to anyone who wants a job done correctly, on time, and no shortcuts. What a pleasure to hire this company. It started with a delightful receptionist who answered my call. Steve came the next day. We did a walk-about together, he gave excellent suggestions, and we agreed on a price. Steve is friendly, efficient, professional, and really listens and offers his customers top-notch service. A week later two of his employees arrived on time, went over everything with me, and got to work. Steve arrived shortly after that and reviewed what I wanted done with them and me. Clay and Jimmy worked hard all day and they were friendly and personable. They also cleaned up all the cuttings, clippings, branches, leaves... My yard looks great now! Steve returned at the end of the day to make sure I was satisfied and everything was done as per our agreement. Thank you! I will hire you again and again. Fantastic work, came in and completed things very quickly. We have a beautiful new fence at a reasonable price. They even cleaned everything up and hauled it away (even swept the driveway and road where they were working). We were very happy. I would definitely recommend ATC Landscape to anyone. I have recently hired ATC Landscape to trim down a large hedge as well as replace a 72' length of cedar fencing (and gates) separating my property from that of my neighbour. Both projects were completed on time and on budget. They do a very professional job and leave a very clean and tidy site when they're done. The fence they built is top quality and their pricing was very fair for the scope of project. I will most certainly utilize their services again in the future. Thanks guys!!! We have used ATC Landscape a number of times now, and I have been very impressed by the quality of work. The young men who came out were pleasant, thorough, and did an excellent job in building a fence. The first time they worked for us was trimming a very high hedge at the back of our house. I received a fair quote which I was satisfied with, but when the bill came we received a 10% reduction as the job was not as difficult as they thought. I was impressed by their integrity. I will use them again, and I highly recommend them. Steve and his team did an amazing job on our very overgrown property. They were very professional and courteous but more importantly they sure are professionals. They know what they are doing!! We are having them back again to add mulch to our much improved gardens. We plan on continuing with ATC Landscape as needed in the future. In our opinion you can't go wrong with this team of hard working individuals. Thanks to all! ATC Landscape provided excellent service for our residential property. Steve's cost-estimate was competitive for the one-day project. Our 2016 winter snowstorm-damaged hedge and our 15 other shrubs, bushes, and small trees were trimmed to our full satisfaction by Brady and Riley. The staff was very friendly, accommodating, and efficient. We will retain ATC Landscape again as needed and we will recommend them without reservation to others. 34A – 2755 Lougheed Hwy.